The elegant Serio Granito water feature is carefully handmade in high quality, grade 304 stainless steel and solid granite exclusively for Aqua Moda. It consists of an innovative C-shaped stainless steel panel, with small seams that direct the water evenly and attractively down the feature, and a chiselled column of hand carved solid granite with LED lighting. This is a combination that simply cant be beaten and will add style and grace to any garden. Hand crafted stainless steel and solid granite construction. 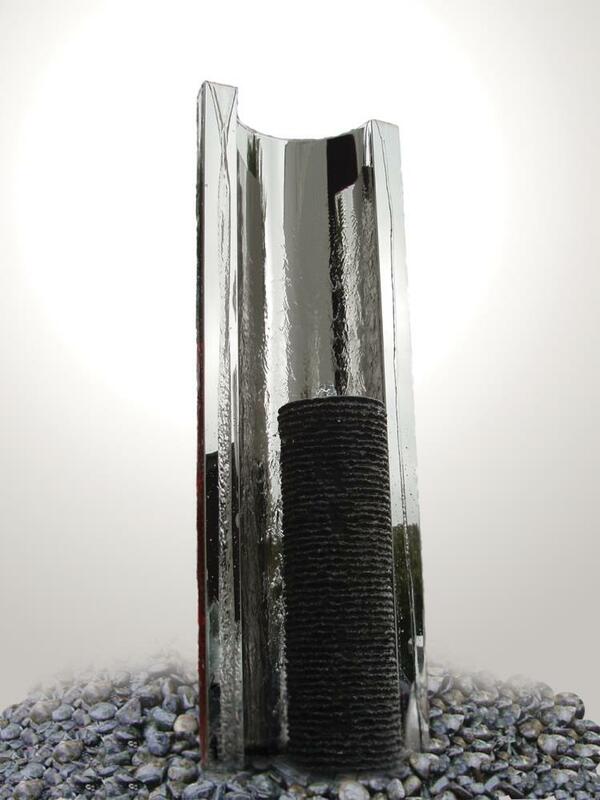 Serio Granito steel and granite water feature. LED lights to granite twist. Reinforced Heavy Duty Pebble Pool 90cm Diameter. "Stunning fountain. Granite sparkles in steel c shape. Fast delivery, 2 days by pallet, and good customer service. All my friends want one!" "This is a lovely fountain, the water dances in the light on top of the granite.. I love it.. looks great in my garden.. Buy the support, the granite weighs a ton and would cause damage if it fell.."
"This water feature is beautiful! It looks amazing and the sound of the water is so relaxing. Worth every penny!! Delivery was really quick and the customer service has been fantastic - highly recommended"